When it comes to marketing, are you looking for the “one thing that really works”—something that will bring ideal clients en masse to your door? From experience, I can tell you that everything works . . . and nothing works. Other marketers may say social media is the answer. Or advertising. Or direct mail. Maybe they’re proponents of website offers, or print brochures, or radio, or seminars. They’re all right, except for one critical piece of information: There is no one action that works in isolation. The secret to success is using a diversified approach—commonly referred to as integrated marketing. This type of marketing plan involves a mix of components that all blend (integrate) to create a whole greater than any individual part. Let’s take a closer look at exactly what integrated marketing communication is and how you can use it. 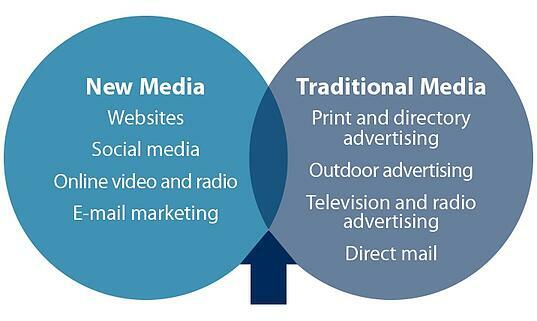 Traditional: Print, television, radio, and direct mail. These methods have been around from the beginning, and we tend to generalize them with one word—print. New media (or nontraditional): Website, social media, e-mail, and multimedia, such as online videos and podcasts. We can sum this all up as online. As the graph below illustrates, the intersection of these methods is where the magic happens! The first step in implementing an integrated and more effective marketing strategy is to take an objective look at everything you’re doing and ensure that your messaging is consistent across all of the methods you use. For example, if you place ads in local publications that speak to your expertise in retirement income planning, but your website has nary a mention of this specialty, you have an issue. Worse, if you’re using print material that does not reference your website—the method most people, regardless of age, use today to learn more about you—this oversight is sure to be noticed by the consumer. Next, consider whether or not you have a mix of marketing “levers” working for you. Do you have a social media presence (if it makes sense for your target market and your brand image)? Do you also have some print advertising for brand awareness? Local brand awareness is easier to achieve than is national awareness, and it is in line with most advisors’ strategies. How about targeted e-mail or mail campaigns for a specific type of client or a particular need you can fulfill? Is that campaign tied to your website? For example, is there a promotional item on your homepage or a link to more information? For any one activity you undertake, consider whether or not there may be a complementary activity on the opposite side of the fence; in other words, match a traditional tactic with a new tactic (see table). You don’t have to do everything all at once; you can step your way in to diversifying and integrating your activities as you get more comfortable. My suggestion is to focus on one initiative and see how many cost-effective and time-conscious ways you can market the messaging, combining both online and print methods. Advertise the event on your website. Create a postcard/mailer about your event or on the subject matter to garner interest. E-mail the invitation to a predetermined attendee list and encourage recipients to forward the message to a friend. Include a button on your website so participants can register/reserve a spot. Conduct an e-mail campaign around diversification for a set period of time. Post a follow-up piece on the subject on your website for attendees to reference. Write an article on diversification for your e-newsletter. Share details on your LinkedIn and other social media sites. Ask participants to tweet the event to their followers. Share photos from the event (with appropriate permission) on your website and/or social media sites. The good news is that most of your online media activities will be free; the only spend is on your (or your staff’s) time. My hope is that these strategies all sound intuitive and even a little bit fun. The integrated approach may not be the marketing magic bullet, but it will present your brand in a seamless and consistent way, using various channels and media to effectively reach your ideal clients and prospects. 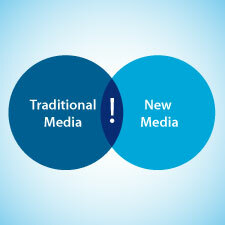 Do you tend to use more traditional or newer forms of media? What avenues have you used to create local brand awareness? Please share your thoughts with us below.